How much candy does it take to fill 2000+ colorful plastic eggs? Come to Buck Lake Park at 10:30 am on Saturday, April 20 to find out, and start off your Easter weekend right. 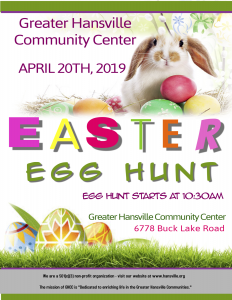 We will have eggs hidden in the grass for 0-6 year olds and a straw pile full of candy and quarters for 7-10 year olds. There will also be special “golden tickets” hidden in lucky eggs that will win a gift basket of toys and fun surprises.